Apply morning and night in gentle tapping motions all along the eye contour. 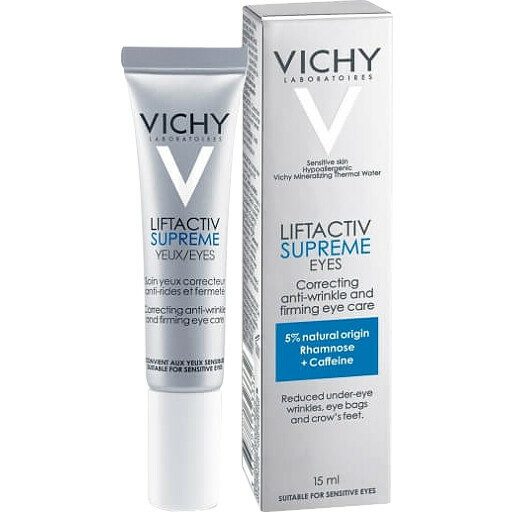 Vichy LiftActiv Supreme Eyes 15ml is rated 4.3 out of 5 by 10. Rated 5 out of 5 by beautyfan1 from A really great product No-one will ever not get wrinkles around the eyes, but having a decent eye cream will help them to look less noticeable. I started using eye creams in my early 20's and now in my late 60's I'm sure it's paid off. I've used the Aqualia Thermal for a while, but needed something a bit richer for the winter months as the skin round my eyes needs extra help. I can't say I've noticed much in the lift and firming aspect, but every little bit helps. It's certainly very much better than some eye creams that although are richer, can also be heavier as well. It sinks in really well and has a very light pleasant fragrance. I'll keep the Aqualia Thermal for the summer when I want a lighter eye cream. I will definitely buy this again. Rated 3 out of 5 by Ratty from Vichy eye cream Been using this for around 2 weeks every morning. Has no noticeable scent, is absorbed well but no miracles have happened. Just leaves my eye area moisturised without causing irritation. Rated 5 out of 5 by Madie from 5star product for eyes I start using it as a recomandation from a friend...reduces the puff and dark circle..also makes the eyes brighter. Rated 5 out of 5 by CazGibbs from I love Vichy I have been using Vichy products for some years now and I absolutely love them. They have a product for pretty much everything (or so it seems) and I am really happy with what it does for my skin. This eye cream I would certainly recommend.